Some 40 grams of pig sperm will be taken on board the Shenzhou VI spacecraft for its October launch. Some of the sperm will be kept outside the spacecraft's biological capsule and some inside, according to China's Xinhua news agency. Surviving sperm will be returned to Earth and used to understand better the processes involved in pig reproduction. Agricultural experts hope to use the sperm to fertilise pig eggs back on Earth - to see what effect a period of microgravity will have had on the sperm's activity. 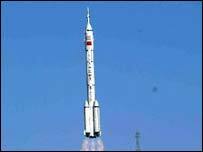 China's first manned spaceflight two years ago made it the third country able to launch a human into space on its own, along with Russia and the United States. During the upcoming mission, two astronauts will orbit the planet five or six times.